﻿Philadelphia is not in the Midwest. Neither is Michigan. Iowa, Minnesota, Nebraska, and Ohio aren’t in the Midwest either, because the Midwest exists solely in my mind. My Midwest is a feeling. I feel conscious of the fact that it’s a feeling I will never be able to fully communicate. In it lie forests, plains, convenience stores, grain silos, highways. It contains nebulous ideas of youth and anecdotes of silly little mistakes. When I say the word “Midwest,” I’m standing on the corner of Shaw Street and Lake Lansing Road on a Friday evening in late May, looking out at the rickety sheet metal pier on the lake while the mosquitoes buzz by my head. I enjoy talking about the Midwest. There’s a lot of nothing there. The corn fields and grazing pastures impart their open space onto you, transmitting a sort of calm that I associate specifically with the words “rolling hills.” Emptiness can be good for the soul, and there’s just enough emptiness there to make me feel welcome. It feels like there’s always somewhere I can be without bothering anyone. All of my memories have distinct geographic places, or at least their phantoms. Everything that has happened to me happened to me somewhere; occasionally I forget what somewhere is, but I still know it’s there. Placing myself in a memory is a thought exercise for me: I have to reconcile what I remember of my lived experience with my personal beliefs and thoughts of where I remember it happening. Sometimes the two don’t click and I’m left wondering if what I’m thinking of was even real. Much of my life has been spent moving. I only started living in Michigan at the beginning of my sophomore year of high school, which makes it even weirder that I can picture pretty much any moment I’ve experienced happening there. There’s something about that place that lends itself to my psyche. It agrees with me. I’ve spent a lot of time over the last few months sitting in my room and thinking about home. I think of a tree-lined road near my house that a few of my friends lived on and I think of driving slowly down it and looking out the window. As the maples and firs on the side of the road pass by me, I gain access to the full experience of my life at home: late night rides in cars on I-69 and summer bonfires and snow day sleepovers coalesce into a single sensation, a lightness in my chest. Melancholy, nostalgia, warmth exist as one in that moment. It’s unabashed sentimentality. Music can remind you of home, but it can also be home. When I sit in my room, I like to listen to (Sandy) Alex G. Alex G (short for Alex Giannascoli) is from Philadelphia, but makes music that, to me, is the Midwest. When I hear Alex G, I experience home more strongly than at almost any other time. Alex G’s music is incredibly special to me because of its intangibility. In his songs I hear the ghosts of times that I simultaneously have and haven’t experienced. I hear days spent in wooded backyards and on covered porches. I hear nights spent at empty playgrounds and on pleather couches. I hear home just the way I want to hear it—the purest expression of everything I did and wanted to do there. selling pills to a girl from across the block. I told him he should quit that sketchy scene. He said nothing compares to the fever dream. Alex once said in an interview that “the reality of a song’s meaning” doesn’t “compare with that untouched story in your head.” The story in my head for this song is one of the seedy mystique of a small town. All of the odd things that go on in empty grocery store parking lots and behind paint-chipped doors to tiny residential homes seem to express themselves at once. I find the last line of this lyrical sequence particularly meaningful. “Nothing compares to the fever dream” seems like something I’d say about home. Dreams, like those I have of home, are often rendered sparsely when spoken of. They’re incomprehensible in description, but perfectly ordinary in mental experience—nothing compares to them because nothing real can. At times my recollection, my fever dream, of home doesn’t seem real, but that doesn’t make the memories any less valuable. that every word I said is what I really meant. then we can be together for another night. Then we can have those dreams like no one else. It's just one more reason to control myself. Alex sings these lines in harmony with a high-pitched backing vocalist, giving them an ethereal echo, as if there were a thin, shiny film over each of his words that would instantly disappear if touched. These lyrics are interesting when read, but take on a unique power when sung, almost like an incantation. They slough off meaning, not even attempting to bridge the gap between thought and speech that lyricists and linguists alike fret over. Like a sugarcube in water, they dissolve into nothing; in that nothing there is sweetness, a sweetness that pools around you and cannot be achieved through full understanding. An album is invariably wedded to its cover art. The visual representation a musician (or their record label) chooses to associate with a certain collection of their works provides the listener with further context of the artistic process behind creating these works. (Sandy) Alex G’s album covers are beautiful in their simplicity, often consisting solely of text over an image. 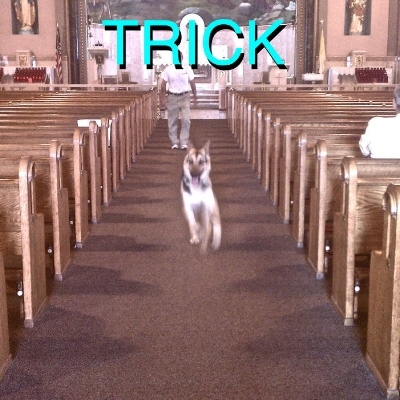 My favorite album cover of his is for his album Trick. The already disorienting image of a dog running towards the camera—and, by extension, the viewer—is placed in the aisle of a small church. Churches like the one on the cover of Trick are the social and spiritual centers of the Midwest. They’re where life and its progression occurs, places of both consistency and change—Christmas and Easter masses, baptisms, confirmations. Dogs, and pets in general, are symbols of memory. In youth, they are companions whose presence in life, though temporary, seems eternal—and can nearly be, in your thoughts. These images are juxtaposed beautifully in a photo that looks like something you would find on the camera roll of an old camcorder after giving it new batteries. One thing I find beautiful about music is its ability to tap into veins of emotion that you didn’t even know you had, conveying exactly what you’re really thinking but just can’t find the words for. This comment serves a very similar purpose for me. It’s a minor, possibly unconscious retrospective on the transition from home life to adult life, rendered in a particularly “Internet” fashion that I find both endearing and oddly symbolic of my youth as a computer fiend. Wherever that YouTube commenter is, I’m with them, in one way or another. Every time we listen to this song we enter a collective headspace, some perverse modern geist that just might be home.